Fergus locates both Gilger and the ship in the farthest corner of human-inhabited space, a backwater deep space colony called Cernee. But Fergus' arrival at the colony is anything but simple. A cable car explosion launches Cernee into civil war, and Fergus must ally with Gilger's enemies to navigate a field of space mines and a small army of hostile mercenaries. What was supposed to be a routine job evolves into negotiating a power struggle between factions. Even worse, Fergus has become increasingly -- and inconveniently -- invested in the lives of the locals. It doesn't help that a dangerous alien species Fergus thought mythical prove unsettlingly real, and their ominous triangle ships keep following him around. Foolhardy. Eccentric. Reckless. Whatever he's called, Fergus will need all the help he can get to take back the Sword and maybe save Cernee from destruction in the process. 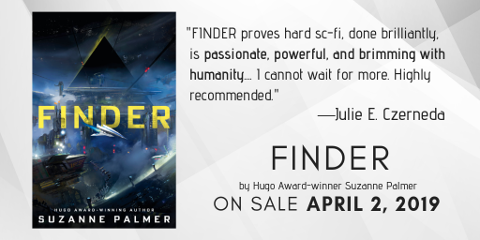 "While Palmer excels at worldbuilding, plot intricacy, and pacing, the real power here is in the emotional connectivity of her main character. 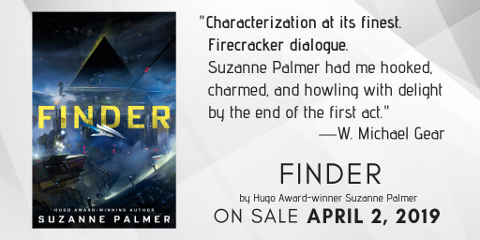 Ferguson is a brilliantly developed, multifaceted antihero -- deeply flawed yet effortlessly identifiable -- and, largely on the strength of that depth of character, Palmer has built a solid foundation for what could be a highly entertaining SF adventure series."